Are you brave enough to get onboard? 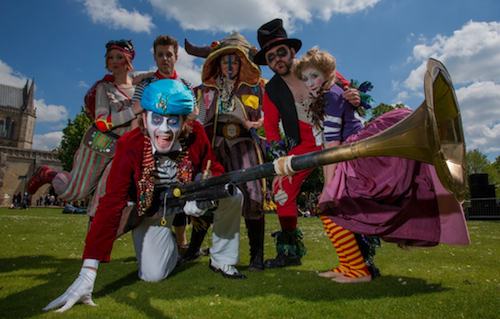 Then come and experience Les Enfants Terribles’ Marvellous Imaginary Menagerie! From the makers of The Terrible Infants and The Vaudevillains comes an outdoor spectacle like no other. Packed with circus, puppets, dance, music and magic; our professional charlatans will regale you with tales of wit, virtue and courage, all loosely based upon Aesop’s fables. “Razor sharp theatre group Les Enfants Terribles” (THE TELEGRAPH) are dedicated to creating original, innovative and exciting theatre that challenges, inspires and entertains. We are constantly pushing ourselves to explore and develop new techniques and methods to tell stories whilst at the heart of our work always remaining accessible to our audience and ever growing fan-base. Set up by Oliver Lansley and co run by James Seager, the company has over 10 years of experience and have toured the World. Lansley is a published play write. Key collaborators include experienced director Emma Earle and award winning Designer Sam Wyer.